My friend and fellow Holidailies participant, The Mighty Kymm, tagged me on Facebook with the challenge to list – without thinking about it – ten movies that have stayed with you. Life Without Zoe: Another film I originally saw in San Francisco. It’s actually part of an anthology, New York Stories, but that segment is my favorite. Who wouldn’t want to live in a boutique hotel, have a famous flautist for a father, and go to schools with sheiks’ sons? Frankenstein: The original black and white film with Boris Karloff was my first horror movie – I was six or seven – and I remember having to sleep with my closet light on for weeks afterward. Ultimately,I became a really big horror movie fan. The Lover: There was a lot of controversy when this film first came out, because it involves the affair between a 15-year-old girl and a 20-something man (though both lie about their ages). Jane March, who played the girl, had barely turned eighteen when filming began. It’s a quirky, arty film, but even though it’s really explicit, it’s also really well written, and beautifully shot. Midnight in Paris: I know it was everyone’s favorite thing of the summer when it came out a couple years ago, but it was everyone’s favorite for a reason. While it did not make me run off to Paris, it did remind me why I love to write. Marley & Me: Yes, it’s silly. Yes, the ending in sad. But I work in rescue, loved the book, and was still learning how to communicate with my first big dog, Max, when it came out. We Bought a Zoo: I didn’t read the book until after we’d taken my parents to see this for Christmas, which is good, because the film changes a lot. It also leaves the core of the story alone. My stepfather kept complaining about it – I think he was confusing it with some Zoo comedy – but by the end we were all teary. Btw, the book is amazing, and you should read it. Empire Records: This isn’t the world’s greatest film, but it always makes me happy. Also, it’s fun seeing the cast (Liv Tyler, Renee Zellweger, Ethan Embry) looking like babies (well, high school students). Little Women: The 1995 version is my favorite because it touched a little on transcendentalism, and I liked the casting, but I know a lot of other people hated it. But this is my list, and it’s one of the films I re-watch at least once a year. So, yeah. 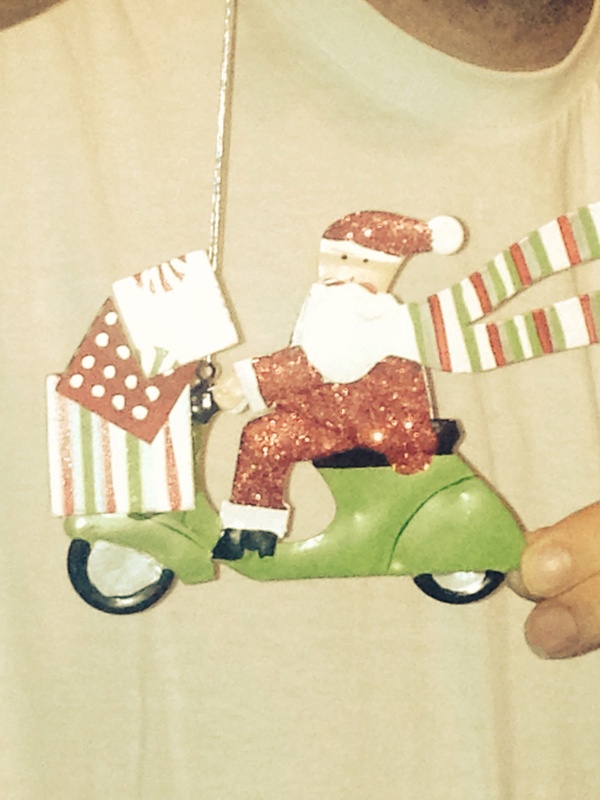 Today’s Santa: An ornament that amused me, once upon a time.